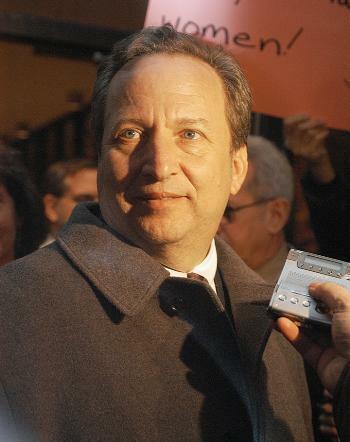 University President Lawrence H. Summers speaks to the media yesterday outside the Loeb Drama Center after the Faculty voted that they lack confidence in his leadership. In a sharp and unexpected rebuke of University President Lawrence H. Summers, members of the Faculty of Arts and Sciences (FAS) voted yesterday that they lack confidence in his leadership. Voting by secret ballot in a Faculty meeting at the Loeb Drama Center, 218 faculty members affirmed a motion put on the docket by Professor of Anthropology and of African and African American Studies J. Lorand Matory ’82, stating that “the Faculty lacks confidence in the leadership of Lawrence H. Summers.” One hundred eighty-five voted against and 18 abstained from the motion, which was tantamount to a vote of no confidence. A second motion, expressing regret for Summers’ Jan. 14 remarks on women in science and certain “aspects of the President’s managerial approach,” also passed the Faculty. Two hundred fifty-three faculty voted for that motion, which was submitted by Thomas Professor of Government and Sociology Theda Skocpol. One hundred thirty-seven faculty members voted against the motion, and 18 abstained. The two non-binding motions, unique in Harvard’s history, are largely symbolic gestures—only the Harvard Corporation, the University’s top governing body, can force Summers to step down. While last month’s Faculty meetings focused on Summers’ adversarial leadership style and his controversial remarks on women in science, yesterday’s discussion leading up to the docketed motions focused instead on what the two votes would mean for the Faculty, and whether the votes should take place. Debate on the vote of lack of confidence—and a short-lived motion to table Matory’s motion altogether—consumed the first hour of the meeting before Matory’s motion was put to vote shortly after 5 p.m.
Summers was stoic while the FAS docket committee announced that the lack of confidence motion had passed the Faculty, but once the announcement was finished, he covered his mouth with his hand, and his expression soon changed to one of surprise and deep disappointment. This meeting, the third devoted exclusively to the Summers crisis, drew a packed crowd to the Loeb auditorium, where some professors sat in aisles or stood against the wall once all 556 seats were taken. The entrance line spilled out onto Brattle Street, mixing with the press and curious onlookers forced to stay outside the much-anticipated meeting. The Loeb was chosen for its size—the venues of the two previous meetings, the Faculty Room and Lowell Lecture Hall were too small to accommodate the large number of faculty in attendance—but the auditorium lent the meeting a theatrical air. “This is not theater, albeit it has its comic and tragic elements,” Professor of the History of Science Everett I. Mendelsohn said at the meeting. The 421 faculty members who voted on Matory’s motion represent over half of the 802 voting members of FAS. Full professors, associate and assistant professors, and a smaller number of administrators and professors who hold appointments in other University schools are allowed to vote at Faculty meetings. Typical meetings, held once a month in the Faculty room during the school year, draw anywhere between 100 and 150 faculty members. Like Summers, Faculty members seemed shocked by the result of the lack of confidence vote. After the meeting, professors contacted by The Crimson—including Matory—said that they did not expect the lack of confidence motion to garner so much support.